Bryan Cranston and Kevin Hart in The Upside. The true story of paralysed French Corsican businessman Philippe Pozzo di Borgo and his caregiver Abdel Sellou was the subject of the 2011 French film Intouchables, a critically ac­claimed, multi award-winning film that went on to become France’s second biggest box-office hit of all time. The uplifting story of the friendship between a multi-millionaire rendered quadriplegic after an accident and the ex-con who becomes his carer struck a chord with international audiences. It is no surprise that its heartstring-tugging subject would find its way into an American remake. 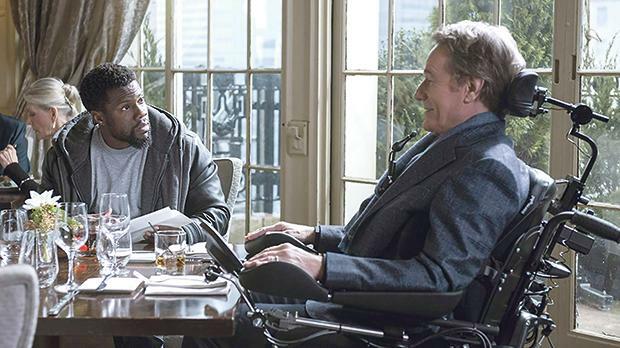 Taking on their French counterparts’ roles are Bryan Cranston as Phillip Lacasse (Cranston), the Park Avenue billionaire paralysed by a paragliding accident and Kevin Hart as the recently released from prison ex-con Dell Scott. Scott is unable – possibly unwilling – to find a job, which he desperately needs in order to pay alimony to his ex-wife and young son. Thinking he is applying for a janitor’s job, he finds himself with a number of more qualified hopefuls for the job as caregiver to Lacasse. After a rather unorthodox interview – and to the chagrin of Phillip’s friend and former business associate Yvonne (Nicole Kidman) – Dell gets the job and despite his complete lack of experience in dealings with the demands of the disabled Phillip, the two men forge a very strong friendship. The Upside delivers pretty much what it says on the box – a solid buddy movie laced with equal parts drama and comedy where two people from opposites sides of the tracks come together under unusual circumstances, become friends, fall out, make up and live happily ever after. So, yes, it is warm-hearted and unpretentious, slight and highly predictable. What makes the film worth watching, however, are the performances by its three leads. Solid, unassuming and sympathetic Cranston is great in projecting Philip’s mix of acceptance and anger at his situation, seeing in Dell a chance to get more out of life than his mundane routine that takes him from his bed to his chair and back again with little by way of stimulation in between. Granted the film never really explores in great depth his trials, spending little time on the accident and the true implications of living with a serious disability of that kind, yet Cranston effortlessly injects the mood swings from helplessness and despair to enthusiasm and hope for the future that Phillip experiences. Hart gets to display that there is more to the actor than the broad, often crass comedy that we usually witness in his films… reining in his instinct for buffoonery for a well-judged portrayal of a man keen on turning his life around but unsure of how to go about it. Yet he’s not all serious all the time – the film is full of obvious fish-out-of-water scenes as he negotiates the trappings of extreme wealth. In these moments, Hart exploits the funny to the hilt. On her part, Kidman easily elevates a rather thinly-sketched prim and proper character, adding many subtle shades to Yvonne, a woman willing to sacrifice her own personal life and career advancement to help a friend in need. There is an infectious chemistry between the three – Dell coaxing out of Phillip the latter’s sense of fun; Phillip trying to motivate Dell into discovering what he truly wants out of life; while Dell sees the warmth and humour that lies beyond Yvonne’s aloof façade. Rising above the predictability of proceedings are a number of solid scenes that cement the burgeoning friendship between the two men – Dell taking Phillip outdoors and out of his comfort zone for a number of jolly escapades. Some of the escapades involve weed, others a fake stroke. A poignant one involves a potential date for Phillip, which makes it easy for the audience to engage with them both and accompany them on the ride. Glass: (Class 15) - Security guard David Dunn uses his supernatural abilities to track Kevin Wendell Crumb, a disturbed man who has 24 personalities.